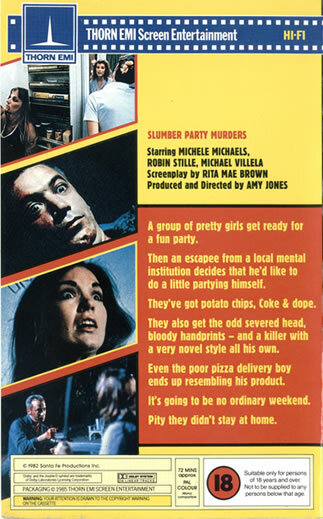 The Slumber Party Massacre was retitled Slumber Party Murders for the UK video release, which was mildly edited. 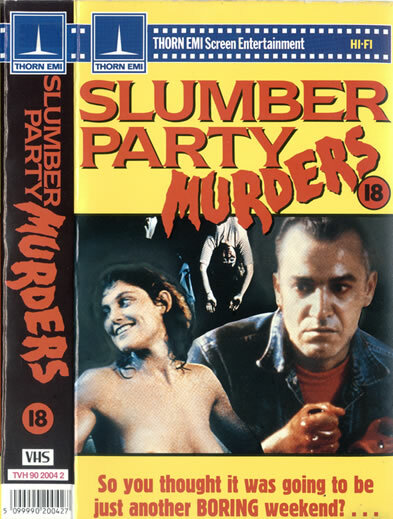 The UK version, re-entitled Slumber Party Murders, is very crudely cut, missing out every gore scene apart from the climax with the death of the killer. This may have been due to the "video-nasties" craze, and Thorn-EMI (the distributors) may have been aware of the trouble the film "Driller Killer" (1979) had caused, as the main weapon used by the killer in this film is also a drill. In this era, a film couldn't even have the word "Massacre" in its title, explaining the film's re-naming. In June 2003, The UK version was passed for DVD release with its original title and all previous cuts waived. "The opening I shot and gave as a reel to Corman, which got me the job, had a Ouija scene in it. I don't have a copy. He probably tossed it out. We couldn't use it in the film because I'd done it with non-SAG actors. The same actor was the killer, however. It looked far fancier than the final film because my husband, a famous cinematographer [Michael Chapman], shot it. He didn't shoot Slumber Party, so it was a good deal more primitive. The opening was a rewritten version of the opening of the Rita Mae Brown script, Don't Open the Door, which I did a huge rewrite on later to make SPM. It was a "prologue" establishing the killer years earlier. I don't really remember Rita's draft. The bones of it were similar but it was a big rewrite. I didn't take screenplay credit and it was the first thing I ever wrote." The New Concorde DVD release is missing some of the dialogue on the radio that wakes Trish up in the beginning. It is also missing a tad of the telephone repairwoman stepping down the ladder right before Jeff approaches her. These are both intact in the original US VHS editions, the IFC broadcast, and the UK DVD - which is sped up from being in the PAL format, explaining why the running time is short. The version shown on IFC includes the old '80s Paramount logo before and after the film (this is because they acquired rights for foreign distribution and cleaned up the print themselves, which was obviously the same case with The Boogens when it showed on IFC), and the ending credits show the copyright being 1981, Local Color - instead of 1982, Santa Fe, as is on the other versions. I must also note that this is the cleanest and most complete print of the film I have seen. However, a skeptical fan will wonder which version has the most accurate and correct matting, since the IFC version seems to be zoomed in a bit but also show a little more information on the bottom here and there. I feel that since the New Concorde DVD is now discontinued, this print plus some more extras other than just the trailer, would do the film justice in the DVD department. Jason Paul Collum told me about an old friend (who now lives in the UK) who taped SPM for him off HBO back in the '80s. He said that the opening title was completely different from what is shown in every other version. Instead of showing the classic poster/video cover artwork in red font, it was just black type-written font against the background. Very interested in seeing this version, but Jason has unfortunately since lost his VHS copy. According to Debra De Liso, a ouija board scene was actually shot but deleted from the final film. The girls were supposed to be playing with a ouija board (of course, before they were aware of Russ Thorn) and when the planchette spells out "DEATH," the girls get freaked out and stop playing. Neil's (Joseph Alan Johnson) death scene was originally so gory that the film received an X-rating!